Boca’s Goreleigh Willis tangles with a Manhattan player on his way to goal in U23 MSSL opening day action at Ft. Dix on Saturday while all five Boca SYL boy’s teams squared off in Super Y-League competition on Sunday at the Manchester Soccer Complex in this week’s edition of the Boca Soccer Wire. All five Boca SYL boy’s teams saw Super Y-League action on Sunday at the Manchester Soccer Complex with two U15 players getting a hat trick each and the Boca U23s opened their 2004 Summer season with 2 games during the MSSL kick-off festival at Ft. Dix. 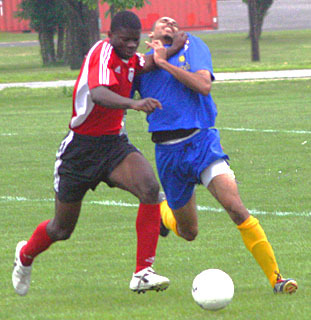 The Boca U23s squared-off against PDA, one of the top soccer clubs in the US on Saturday morning, in their 1st game of the 2004 MSSL season. In a game that was intense and competitive from the first whistle, the U23s failed to convert their scoring opportunities during the first half while PDA capitalized three times on theirs with the third goal coming with less than a minute left in the half. Early in the second half, the U23s lost a player to a red card ejection and played with 10 men for the remainder of the match but still managed some chances they could not finish. John Curry-Edwards (St. Rose HS) who will attend Old Dominion University in September played the entire match in goal and helped the Boca U23 defensive crew keep PDA at bay for the entire 2nd half. In their 2nd game of the day, Boca gave up a goal mid-way through the first half against a strong Manhattan Kickers side from New York. The U23s kept working hard and evened the score in the second half as Bricktown native Justin Fuccello (Rutgers University) buried a rebound past the Manhattan keeper. Boca keeper Sean Grayson (Middlesex County College), who played the full game, kept Boca in the match with several key saves late in the game to preserve the 1-1 tie. Coach Wolf Finger and the Boca U19 SYL team had their hands full on Sunday afternoon in Manchester as they faced powerhouse Super Nova FC from Harrisburg, PA. In a game that started slow for both sides, Boca ran into a furious Super Nova attack that produced 5 goals in the match. Although Boca had some opportunities, they could not capitalize on any of the same. Next up for the U19s is a home date on June 22nd with the Philadelphia Soccer Club. The Boca U16s hosted a strong side from Reading in a SYL match on Sunday at the Manchester Soccer Complex. Although Boca had some scoring opportunities in a very tough match by both sides, they could not muster a goal while their opponents found the net only once. Kevin Melfi of Medford and US National Team member Joe Sorrentino from Hamilton had three goals each as the U-15 Jersey Shore Boca SYL team defeated the Reading Rage 6-1 at the Manchester Soccer Complex on Sunday afternoon. Sorrentino also tallied 2 assists while teammates Dwayne Dove and Chris Gentz each assisted once. Coach Bill Carroll and the Boca U14s improved their overall SYL record to 2-1-0 with a hard-fought 1-0 win against the Reading Rage on Sunday afternoon at the Manchester Soccer Complex. Shane Ferguson nailed the game winner for Boca, described as a daisy cutter by Coach Carroll. Boca GK Garon Smith played with authority between the pipes the entire match making several key saves to protect the win. In the first game on the day on Sunday morning at the Manchester Soccer Complex, the Boca U13s started well but eventually lost 6-1 against their opponents from Reading. However the game was closer than the score indicates. Boca scored the first with goal at the 10 minute mark, and then during some parts of the first half, continued to dominate play. The U13s goal was scored by Dylan Marx, on a shot taken from about 25 yards outside the box. He was assisted by Craig Rutter. Reading tied the game at about the 20 minute mark off of a shot and deflection and then scored two quick goals just before the end of the half that set the tone for the second half which Reading totally dominated. The 4th goal against the U13s was an own goal that came just two minutes into the second half. The Boca U13s drop to 2-2-0 for the season.